We’ve all waited through a long and frigid winter to make it to spring and we’re only a few short weeks away from sunny days coming back into our lives! With that in mind, now is the perfect time to make plans for a spring vacation to Myrtle Beach! And the middle of March couldn’t be a better time since St. Patrick’s Day conveniently falls on Saturday, March 16th. Now that you’ve got a great reason to book a weekend getaway to Myrtle Beach this March, let’s tell you all about the North Myrtle Beach St. Patrick’s Day Parade, one of the longest-running annual events around the Grand Strand! Kicking off on Saturday, March 16th, the North Myrtle Beach St. Patrick’s Day Parade takes place along historic Main Street right in the heart of North Myrtle. This is the 31st year that Main Street has turned green and celebrated Irish culture and heritage and over 30,000 fun-loving spectators will pack the area. The parade begins at 9 AM rain or shine, so even if there’s some precipitation just grab your favorite green poncho or raincoat and enjoy the festivities! Following the parade, three stages of live music and entertainment will be set up along the downtown area playing traditional and contemporary Irish folk and rock. Plenty of great food and drink will be available as well as dozens of arts and craft vendors, and kids will have plenty to keep them entertained at the children’s area with amusement rides and games to play. 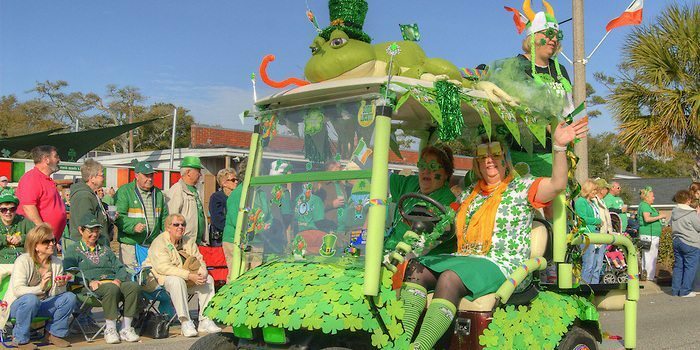 Not that you need a reason to take a Myrtle Beach vacation, but with so much fun for spectators of all ages, the North Myrtle Beach St. Patrick’s Day Parade definitely gives you a great reason to book your trip today! Beach Vacations can help you reserve amazing Grand Strand condos at resorts like Barefoot Resort, River Oaks Resort or Myrtlewood Villas at unbelievable rates. Don’t miss all the fun this spring and make plans for a weekend trip to Myrtle Beach today!